eternal praise of all creatures. The Holy Ghost, the Son of God and His Saints have given high praise to the sacred members of Mary's immaculate body. We may therefore conclude that her blessed heart, the first and worthiest part, is deserving of especial veneration. Shall we not share the sentiments of Jesus Christ, our Head, and follow the example He gives us? Mary's Divine Son, who has willed to be our Head and our Brother, manifests great zeal in honoring even the smallest exterior detail of the person of His Most Blessed Mother. Who therefore can dare to criticize the other children of this Mother of Fair Love, if, following the spirit and example of their divine Head and Elder Brother, they render special homage to her maternal Heart and celebrate a feast in its honor with the permission of Holy Church? There are five marvelous prerogatives of the corporeal heart of Mary which render it forever worthy to receive the veneration of men and angels. The first prerogative consists in the fact that the heart is the principle of the life of our holy Mother. It is the principle of all the functions of her bodily, material life, ever holy in itself and in its every function and employment. It is the source of the life of the Mother of God, the life of her who gave birth to the only Son of God, the life of the woman through whom God gave life to all the children of Adam, sunk as they were in the abyss of eternal death. Finally, her heart is the source of a life so holy, so noble, so sublime that it is more precious in the sight of God than the lives of all the angels and men. The second prerogative of the corporeal heart of Mary is that it produced the virginal blood with which the sacred body of the God-Man was formed in the chaste womb of His blessed Mother. The third prerogative of Mary's heart of flesh is that it was the source of the human, material life of the Infant Jesus during the nine months that He dwelt in Mary's sacred womb. While the infant is in its mother's bosom, the mother's heart is to such an extent the source of the infant's life that both mother and infant can be said to depend upon it for their existence. Mary's admirable heart was therefore the source of the two most noble and precious lives, at once the source of the holy life of the Mother of God and of her only son, the humanly divine as well as the divinely human life of the God-Man. The fourth prerogative of the amiable heart is noted in the words of the holy bride to the divine bridegroom, that is, of Mary to Jesus, who is her Son and her Father, her Brother and her Spouse: "Our bed is flourishing" (Song 1:15), that is, our bed is covered and perfumed with flowers. What is this bed? It is the pure heart of the Blessed Virgin where the divine Infant so gently rested. It was a great privilege for St. John, the beloved disciple, to have rested once on the Savior's adorable breast, from which he drew such great light and derived the knowledge of so many marvelous secrets. But not only once but many times did our divine Savior rest on the virginal heart of His dearest Mother. What abundance of lights, of grace and of blessings the Eternal Sun, the very source of light and grace, must have poured into that maternal heart, on which He rested so often! Her heart never interposed the slightest obstacle to divine grace. On the contrary, she was always disposed to welcome every celestial favor. Our Lord loved her heart more than all other hearts put together, and was in turn loved by it more perfectly than by the hearts of all the Seraphim. What union, what intimacy, what understanding, what correspondence between these two Hearts! What fire in these two furnaces of love constantly inflamed by the breath of the Holy Ghost! And now we come to the fifth prerogative of this holy heart. It is the altar upon which a great and perpetual sacrifice, most agreeable to God, is constantly offered. On it are immolated all the natural passions which reside in the human heart. There are found at once the concupiscible and the irascible appetites of the soul, given by God to man that they may be led to hate, fear, avoid, combat, and destroy the things that hurt them, and to love, desire, hope for, and seek that which will benefit them. These two principal passions comprise eleven others, which are like soldiers fighting under two captains, or like weapons and instruments used to attain the two ends mentioned above. The irascible appetite possesses five passions, namely hope, despair, daring, fear, and anger. The concupisible appetite includes six: love, hatred, desire, abhorrence, delight, and sadness. Man's revolt against the commandments of God caused all these passions to revolt against self and to fall into such disorder that instead of being completely subject to the will, which is the queen of all the soul's faculties, they often make it their slave. Instead of being guardians of the heart in which they reside, preserving in peace and tranquillity, the passions usually become as many executioners who torment the heart and fill it with conflict and war. Such was not the case with the passions that reside in the corporeal heart of the Queen of Angels, for they were always entirely subject to her reason and to the Divine Will that held sovereign sway over every part of her soul and body. 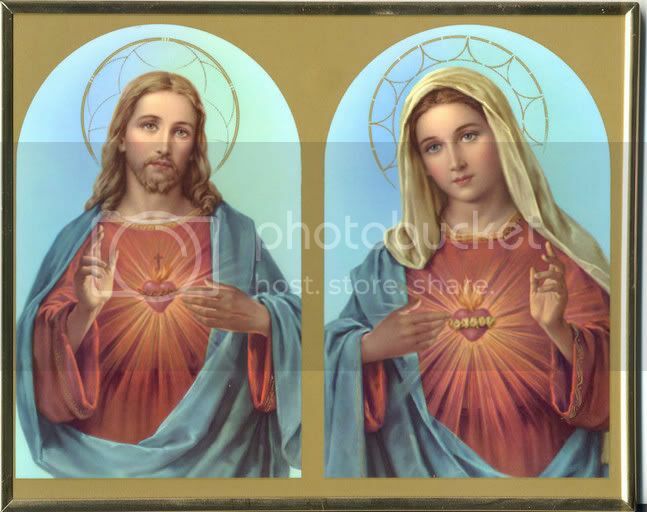 Just as these passions were rendered divine in the adorable Heart of Our Lord Jesus Christ, so were they sanctified most excellently in the holy Heart of His Blessed Mother. The fire of divine love, buring day and night in the ardent furnace of this virginal heart, so purified consumed, and tranformed her passions into its own substance, that, as this heavenly fire had no other object save God alone, towards whom it constantly tended with incomparable ardor and impetuosity, so these passions were always turned towards God and exercised in His service. they were moved and led exclusively by the love of God, which possessed, animated, and inflamed them in so marvellous a manner that they became a perpetual and admirable sacrifice in honor of the Blessed Trinity. We may consider the most pure body of Mary as a sacred tmeple, indeed as the most august temple that ever was or will be, next to the temple of the sacred humanity of Jesus christ, her divine Son. We see her virginal heart as the sacred altar of this temple. We behold Divine Love as the high priest offering to God uninterrupted sacrifices in this temple and on this altar. We contemplate the Divine Will bringing many victims to be sacrificed on this altar of Mary's Heart. Among the victims we distinguish the eleven natural passions slaughtered by the flaming sword which the high priest holds in his hand, that is by the efficacy of Divine Love. They are consumed and transformed into the heavenly fire which burns upon the altar of her heart; they are immolated to the most Holy Trinity in a sacrifice of praise, of glory, and of love. Thus did the great high priest, Divine Love, sacrifice on the holy altar of Mary's heart, all her passions, inclinations, sentiments of love, hatred, desire, aversion, joy, sadness, hope, distrust, fear, and anger. And this sacrifice commenced the first instant the holy Heart of Mary began to beat in her virginal breast, that is the very first instant of this Immaculate Virgin's life. It continued uninterruptedly until her last breath, gaining in sanctity and in love with every passing moment. O great and truly admirable sacrifice, so wonderfully agreeable to the God of hearts! O blessed Heart of the Mother of Fair Love, consecrated altar whereon so divine a sacrifice was offered! Blessed art thou, O most Holy Heart, for having loved and desired nothing but Him who alone is amiable and desirable! Blessed art thou for having established thy joy and thy contentment in loving and honoring Him, who alone is capable of satisfying the heart of man, and for having known no other grief than that caused by the offenses committed against His Divine Majesty! O Blessed Heart, so completely closed to the vanities of the earth and of self-interest that not one trace of them ever found place in thee! Thy confidence in God was equalled by thy firm trust in divine bounty, and, fired with holy generosity, never didst thou give way before the obstacles raised by hell and the world to prevent thee from advancing along the path of sacred love, but thou didst always surmount them with unemitting constancy and invincible strength. These are some fo the marvellous prerogatives of the admirable Heart which beats in the virginal breast of the Mother of God. Is it not true that, even if we considered only the material and corporeal Heart of the Queen of heaven, it would still be worthy of the greatest honor and veneration? Blessed indeed are the hearts of the true children of Mary, who strive to live in conformity with the most holy Heart of their Mother most admirable! Think, think of the honour that is due to her Heart, most noble part of the virginal body that give human flesh to the Eternal Word, forever the center of adoration of the agnels and saints in heaven! What honour is due to her Heart, life-principle of the Mother of God and of God-made-Man! Above all, what great veneration is merited by the Heart that God Himself loved and glorifeid most highly, the Heart that adored and loved God more perfectly than all the hearts in heaven and upon earth! May every heart praise and magnify thee forever!